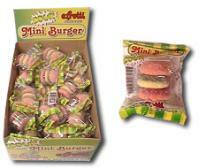 Step right up and get your Gummi Sour Burgers today. This fun filled candy is perfect for pop displays and impulse buying. Display one of America's favorite fast foods at your checkout lines and watch them disappear. Use for party favors at summer parties, birthday parties, or other occasions. 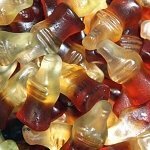 Order this novelty gummi candy today! I bought these as incentive prizes for my elementary school class. They combine gummy candy and sour coating - a win/win for kids! They are a big hit.